Try a fantastic variation of an average cornbread that will be a perfect addition to your festive table. 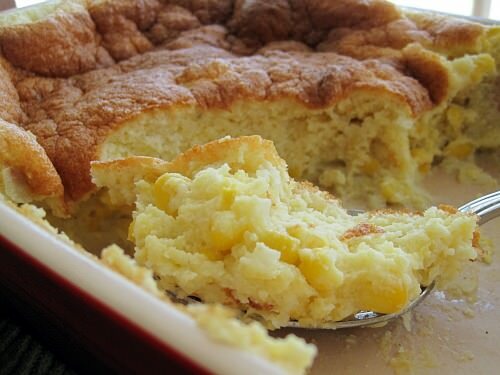 Fresh corn spoon bread puff is so light and fluffy that there will be not a bit left in a blink of an eye! Preheat the oven to 350 degrees and prepare the 2-quard baking dish or eight 6-ounce baking cups, grease them with butter and place on the rimmed baking sheet. Now separate the corn kernels from the cobs into a large bowl. Scrape the cobs with the other side of the knife to squeeze the milk into the bowl. Pour into the corn 4 tablespoons of melted butter, add 1 teaspoon of salt and cook it in a Dutch oven or in a pot until the corn is soft. It will take about 4 minutes. Add the heavy cream and the milk and heat it over a medium heat for it to almost simmer. Take another large bowl and combine sugar, cornmeal, pepper, baking powder, 1 ½ teaspoons of salt. Then pour into it the corn mixture and stir it well. Beat the egg yolks and ladle 1 ½ cups of hot corn mixture into the yolks but only ½ cup at a time and keep beating. Then return the egg mixture into the corn. Beat the egg whites with a bit of salt well until they get thick and then pour them into the corn in three additions. Now you can pour the mixture into the backing dish or cups and put into the oven. Bake for 30-40 minutes until the top gets puffed and golden brown. The dish is ready for serving.